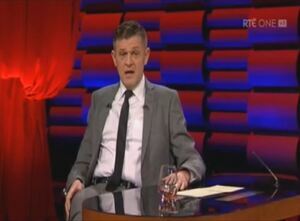 Fearless journalist/broadcaster Brendan O’Connor executes the most embarrassing climbdown in Irish TV history. This week’s fallout from the Panti Bliss interview on RTE has once again put Irish media to the test. Once again Irish media has failed with flying colours. Last night Brendan O’Connor made a pained apology for any offense caused by comments made on the show, pointing out that they were not the views of RTE. As if that wasn’t enough, the Irish Times – the paper of record – made no link between the resignation of John Waters from the board of the Broadcasting Authority of Ireland and his alleged threats of legal action against RTE. Contrast this with the brave stance of the Guardian, which has suffered all manner of threats from David Cameron’s government due to its publication of Edward Snowden’s revelations. But rather than display a bit of backbone, it seems that, thanks to the the flurry of solicitor’s letters from Iona, it has now become the elephant in the room in Irish media – the discussion that cannot be discussed under any circumstances. Silent in all this is David Quinn, founder of the odious Iona Institute. I have asked him several times on Twitter about his legal threats to RTE and Rory O’Neill (aka Panti Bliss), but he hasn’t yet responded. Nor has he answered my query about RTE’s offer of a right to reply to the allegations that the Iona Institute is a homophobic organisation, which was allegedly turned down by Quinn. The intention of all of this is to kill the debate in Ireland as to what constitutes homophobia and whether or not Iona and journalist John Waters are homophobic. Whatever way you look at it, the disappearance of the debate from mainstream media – a debate that has raged for two weeks on social media – suggests several things. The Irish Times – which publishes Waters’ musings – has looked the other way. And the rest of Irish media is in no hurry to draw the attention of Iona’s legal eagles to itself. That would force you to wonder who wrote the apology read out by O’Connor on Satruday night. It’s an important part of democratic debate that people must be able to hold dissenting views on controversial issues. … as long as they agree with those of the Iona Institute, it would seem. Rather than being cowed by legal threats, surely the media has very valid questions to ask – starting with exactly who Iona represent, and where they get their money. The views expressed by Iona – especially in relation to gay people – are very much at odds with the liberal secular society that Ireland has become. Indeed, Rory O’Neill suggested that the only time he experiences homophobia is online or at the hands of Iona and Waters. When they’re done with that, they can ask why Iona is given so much room in the media. In any other country in the world, an organisation as litigious as Iona would never be asked to participate in anything. Nor would anybody else with their solicitor on speed dial. When all that is over, perhaps someone would sit down and ask Quinn, Waters et al to explain how their utterances – perceived by almost everyone apart from themselves and their supporters as being homophobic – are acceptable. Now if you believe – as Waters suggests earlier in that interview – that marriage is a fundamental building block of society, then he is essentially accusing the gay lobby (many of whom are presumably gay themselves) of trying to destroy it. How, exactly, is that not homophobic? Is it reasonable to suggest that gay people are, in trying to secure equal treatment in the eyes of the law, trying to destroy the very fabric of society? Well, if he disagreed with the apology, O’Connor – a columnist with the Sunday Independent and thus not without either power or a platform to exert it – should have resigned. In the interests of public service, RTE should have stood by its man. If they were to go to court – as evidenced above, examples of the irrational fear of homosexuality displayed by both Waters and Iona are not hard to find – they wouldn’t be without hope of winning. But it is the Irish Times and the rest of the media that is probably deserving of the most criticism. It is one of the functions of mass media to provide a platform for debate, but yet again they have abdicated this responsibility. It may be expensive to defend oneself against even the most frivolous of libel accusations in Ireland, but the price for not doing so is the ability to report and to comment without fear or favour. The views expressed by Rory O’Neill are not those of RTE, but they are those of many people in the gay community. His airing them on an RTE program is the very point of public service, and of mass media in general – to provide a platform for debate and scrutiny, and for holding people to account. It should be remembered that Ireland has, since its inception, struggled in terms of holding those in power to account, whether it be politicians, religious leaders or captains of industry. All have at various points used the solicitors to muzzle reporting and debate. But in the end, all of them were eventually caught with their Pantis down.